Talking to young children about safety. 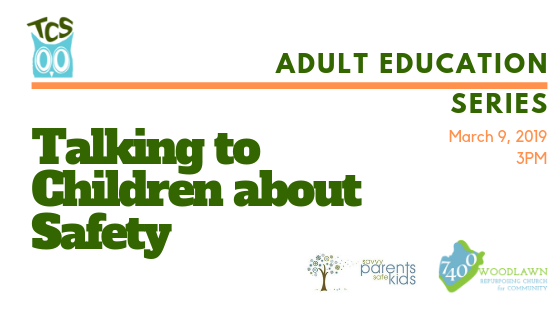 Parents and caregivers, please join us to learn easy, age-appropriate ways to talk with young children about safe body, safe playdates, and how to stay safe in public spaces. Coffee, tea, and light refreshments provided. Sponsored by 7400 Woodlawn and The Children’s School. Event proceeds will directly benefit both non-profit organizations.